Solid modeling is one of the core languages of design. It allows for enhanced communication within the design team, and between clients and customers. Designers have an ever increasing set of tools that use solid models for analysis, visualization, prototyping, and machining. On this page you will find several solid modeling resources developed by University of Idaho students. This course introduces you to concepts and tools for producing solid models and engineering drawing packages that can be efficiently manufactured in an engineering shop. The knowledge, skills, and perspectives you develop will greatly enhance your senior design experience and will be highly marketable in the engineering workplace, including summer internships. HW1a - ME 301 Student Survey. HW1b - a completed Quick Reference Log on the ENGINEERING DRAWING PRACTICES packet. HW1c - ME 301 Self-Assessment of Engineering Graphics Skills (to be submitted separately). Make sure your name is on all parts of the assignment. Staple and submit HW1a and 1b together and submit HW1c separately. BRING TO CLASS: 1) a straight-edge, 2) a pencil, 3) a compass, and 4) a copy of the hand sketching workshop handout (see link in column 2). Your work product will lose points without them. Finish sheets from hand sketching workshop, and identify, describe, and illustrate three hand sketching principles or techniques that you may have struggled with but which added significant value to your finished product in this assignment. Submit the checksheet as your assignment cover page. The mentors will use these in grading your work on each assignment. Create a design layout sketch for an object of personal interest. Do NOT use one of the examples on the website. Use the ME Dept. Drawing Template with grid. Apply best practices learned in class. Don't forget to include the checksheet as your cover page. You may also want to review Examples of Past Design Layout Sketches. Turn in a complete and thoughtful tutorial log on OT Lesson1: Parts. Additionally, print out and turn in at least 5-6 visually-descriptive screen captures of the creation process for the part you made in Lesson1, and provide meaningful captions (1-2 sentences) to explain the content of each image. Make your printouts organized and use an appropriate number of images per page. Print a sketch of your I-beam that shows all sketch relations and dimensions. This should be fully defined. Print out your part information in the summary tab (author, assignment number in keywords field, assignment notes in comments field). Extrude your I-beam to a 3-inch section. Experiment with different material properties. Print your extruded part along with an annotated design tree. Use SolidWorks to compute the mass, volume, center of mass, and moment of inertia about two different axes. Print your results. Identify and describe in detail the two most important things you learned about SolidWorks through this assignment. Print out the assignment checksheet and include it as the cover page for your assignment. Bring a copy of your completed pre-CAD plan and your current progress to next class (keep the original for use in class and for your final submission). HW6 (part c) - your final products (fully defined SW sketch w/minimum dimensions, solid model, and engineering drawing). Refer to the ENGINEERING DRAWING PRACTICES packet for best dimensioning practices in dimensioning your engineering drawing. Print out the initials assignment checksheet (page 2 of the Assignment Checksheet link above) and include it as your assignment cover page. Be sure to clearly address each item in your report. BRING TO CLASS: ALL work-in-progress on the initials assignment (including electronic SW files). Create a customized hammer (with a head for pulling nails as well as a lofted handle). Build from your initial work in the Lofts tutorial. Modify the head and create a custom handle. Your finished model should utilize customized surface appearances, reference planes, and an expanded as well as annotated (i.e., renamed) design tree. Be sure to use the ME drawing template found under course resources on the shared drive. Fill in important linked cells of the title block (DRAWN BY, QTY, PART #, MATERIAL, DESCRIPTION) by editing the part's "File Properties" Summary tab (Author) and Custom tab (Quantity, PartNo, Material, and Description). Variable names are case-sensitive. Your engineering drawing of your hammer should show the length of its handle, dimensions of the bottom of its handle, and the diameter of its striking surface (in metric units). Follow the checklist and submit it as your coverpage. Bring questions about the Revolve and Pattern Features Assignment. Bring your Stirling Engine model to class. Be prepared to show your file structure on the junior drive. 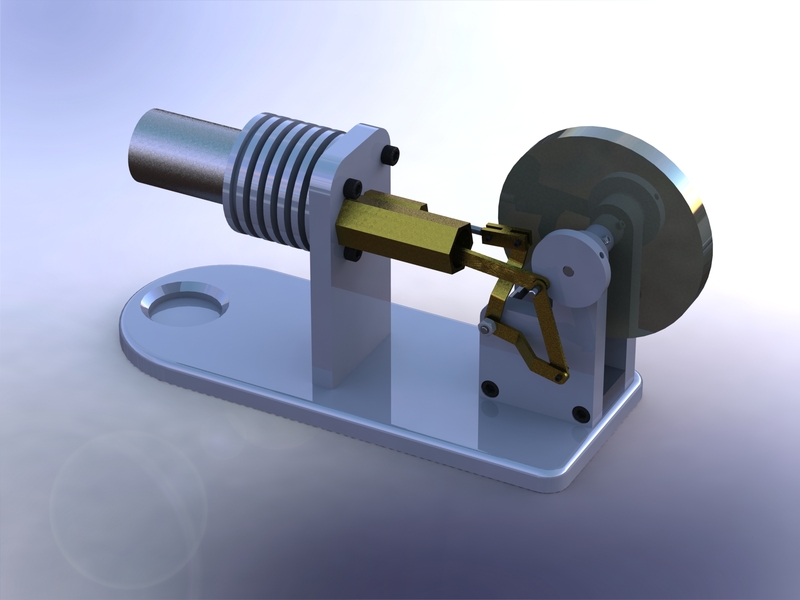 Bring your Stirling Engine model and engineering drawings to class. Modify part assignments based on new insights on part complexity after initial part modeling. EACH MEMBER of the team needs to submit one non-trivial mechanical drawing of one of their parts using the ME template with a customized title block adopted by your team. NOTE: your pre-course skills assessment will be returned to you for your reference in transferring (and/or correcting) your pre-course skill levels onto the end-of-semester survey.